HE bursts with pride that his name is Oz and cherishes the memory of his grandfather who was killed at Gallipoli. But in an Anzac Day twist that captures a century-old, battle-forged respect between Australia and Turkey, Ozcan Ertok's granddad was called Mustafa and he died defending his country from the Allied invaders - including waves of Aussies. And as a tribute to the bond between the two former foes, Oz has built a letter box monument at his Noosa Waters home. 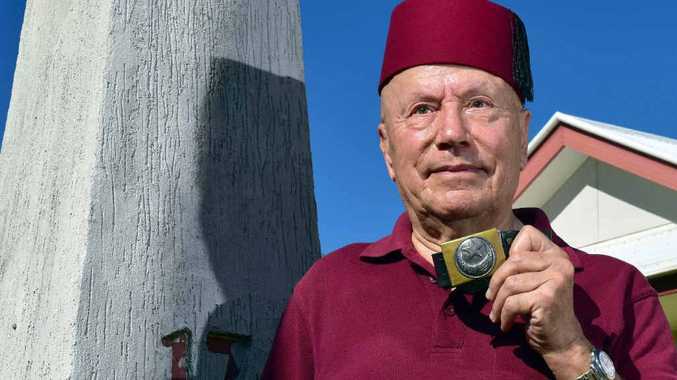 The 85-year-old keeps the Turkish army belt buckle worn by his grandfather on display at his home as a reminder of the sacrifices made by both sides. The incredible part of the story of Oz who migrated here in 1970 with his wife and three children, is that he had to travel halfway around the world to hear of the legend. "I didn't even know the name Anzac there (in Turkey)," he said. The former "ruthless dictator" of Turkey, Mustafa Kemal Ataturk, had set about controlling the local history, suppressing his people as well as the Anzac legacy. "I read a lot of books about Gallipoli when I came to Australia - what a friendship among enemies... when enemies are throwing to each other food and everything," Oz said. "This is very unusual and when I think about that one I still cannot hold myself (back emotionally)." It has been on trips to Gallipoli in 1981, 1992 and 2009 that he has discovered a deep understanding of this bond. Oz said it did not matter that his granddad's burial site remained unknown... blood ties remain. Mustafa's brother ensured a living link by calling his son after the fallen soldier, and his son has passed that name on to his son. "Another Mustafa is living in Turkey and always writes to me," he said.